Decided to make the trip to KFAW for some aircraft spotting on Sat. The weather was a hot , humid and nasty 102 degree and Northerly winds brings us to runway 34. Sung and Myself made that trip and reach KAFW at about 1pm. 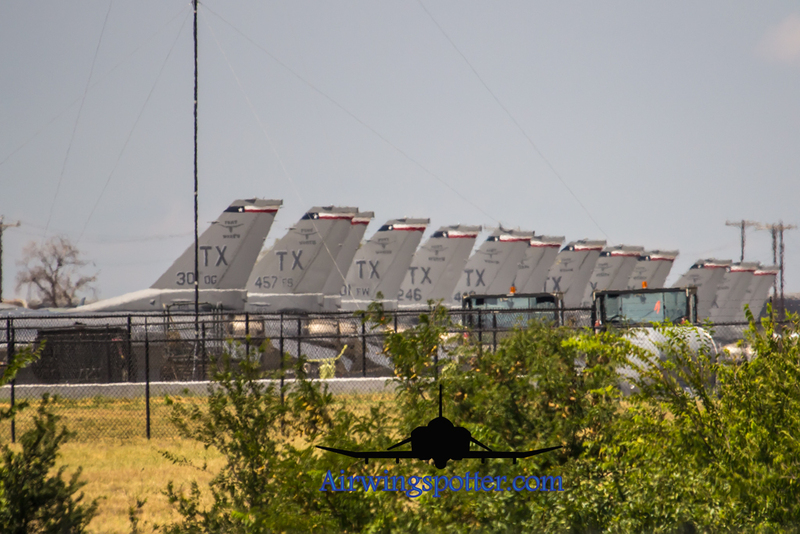 Not much activities, 301st FW ramp was all full of F-16 but no open canopy and looks like a slow day for the F-16. We were hoping for a 1400hrs launch but nothing happen. so much for the Sat to watch Spads. A civilian Chopper took off and did a good bank towards us …. followed by some Cessna 172 and 152 doing touch and go options. We were both really disappointed not getting any F-16 treatment for this Saturday. Actions start to flare up after 2pm when T38C from 87th Flying Training Squadron (87 FTS), Laughlin Air Force Base, started to shoot for KAFW. on the Radio chatter we were getting constant touch and goes and finally 3 of the T-38C made landing on KAFW. After the last T38C traffic landed we decided to head out of the Airfield. While on the way out radio chatter indicated a Heavy coming in to land .. Caught the C17 on the way in from Cabela’s and 114 area. We tried to speed towards the airfield for a nice landing shot but the C17 made the landing faster than Sung’s Volkswagen. SO much for a turbo charged GTI. Caught the C17 by the tower unloading pallets and also personnel. So! all and all not a bad day to catch T38C and C17 from Travis AFB. May try for another weekend to see if the Spads will do much flying. Nice catch on the C17 Dave!!! Maybe next time you will have some Spads flyin. I plan on heading out there tomorrow. Bryan , U should get those Spads flying… the C17 stayed for Sun! so! hopfully he stayed thru the weekend and U can catch them flying out….